The last meal in this series of 5 in 5 is a delicious Sun-dried Tomato Sauce that I put on chicken, but it would be just as good on pasta. There is a wonderful little Italian restaurant in Ottawa called Zola's that inspired me to go hunting for a sun-dried tomato cream sauce recipe. After having their Sun-dried Tomato Mushroom Linguini for dinner one night, I wanted to re-create it at home. One of my favorite recipe sites, Epicurious had a promising recipe for what I was looking for. After a few tweaks, it was similar enough to what I had at Zola's. 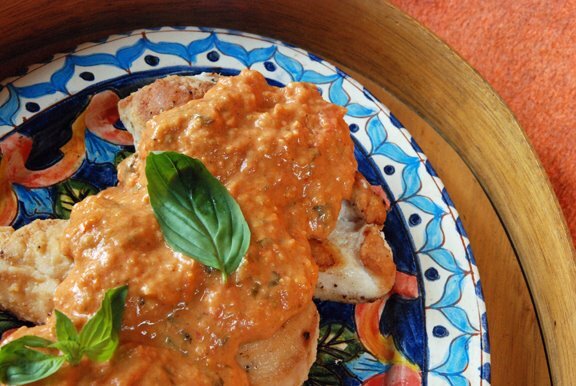 While the Lavender and Rosemary Pork Tenderloin is roasting, you can make the Sun-dried Tomato Cream Sauce for chicken or pasta. Dry the meat with a paper towel and season with salt and black pepper. Heat oil in a large sauté pan over moderately high heat until hot but not smoking. Brown chicken on all sides, about 6 minutes total. (Chicken will not be cooked through.) Set aside. Add garlic, tomatoes, and red pepper flakes to pan and sauté, stirring, until garlic is pale golden, about 1 minute. Add wine and bring to a boil, stirring and scraping up brown bits. Reduce this mixture by half, about 1 minute. Add chicken broth, mustard and soy sauce and bring to a boil, covered. Stir cream and 2 tablespoons basil into sauce in pan and bring just to a simmer. Season with salt and pepper. Serve sauce over chicken and garnish with remaining 2 tablespoons basil. Freeze sauce (before adding cream) and chicken. Recommended freezing time: 4-6 months. Thaw overnight in the refrigerator. Heat sauce and chicken. Add cream and 2 tablespoons basil to the sauce and bring to a simmer. Season with salt and pepper. 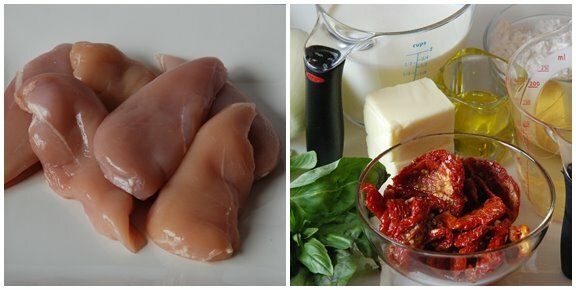 Serve sauce over chicken and garnish with remaining 2 tablespoons basil. ooh, I was waiting for this! And it was worth the wait, especially since it can be frozen. I'm finding that I need to cook a lot on weekends with at least one dish for the freezer. This looks wonderul. I love the way that basil leaf seem to hover above the chicken. It is so tantalizing. Like a well placed feather boa on a stripper who knows which bits to keep secret! Shari, I can't comment as well as Sippity Sup (isn't he fun), but this is my favorite of the five dishes, I think; although I enjoyed all of them. Well done. And, I like that you put the sauce on chicken, and not on pasta which is an obvious. I've had a dish very similar to this one and I can't wait to try your recipe. Hope mine looks half as good as yours too! Wow, that's all I can say, Shari. Just wow! You've served so many amazingly wonderful dishes. And you must have known that tomatoes and cream is one of my favorite combinations! This dish looks superb. I have to make this! I am incredulous at the low cost of these elegant dinners! To think that I can make 38 servings for just over $100?! I'm in!!! I've been making this sauce for over 2 years and it's AMAZING. Try making it without the mustard and add it to pasta! Delicious! It looks really good! I love the taste of sun-dried tomatoes. That sundried tomato sauce sounds so good! This looks utterly divine! Will try it tonight!